The Little Big Man was touring Europe, and Noorderligt was the only Dutch venue he paid a visit. Thankfully I could find a fellow Dio appreciator to drive me there, because public traffic is horrendous after 23:00 if you want to get back from Tilburg, and I definitely didn't want to miss anything of the show. Dio, ex-vocalist of the classic Rainbow line-up and two of the finest Black Sabbath albums (I always preferred him above Ozzy), went solo not long after the Sabs and his ways parted. He made some fine albums, but many believe that the heights attained on the Sabbath and Rainbow albums was never quite equalled. 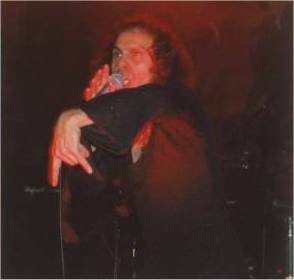 Still, during his solo career Dio has also produced some memorable tracks in the vein of "Last in Line", "Holy Diver" and "Rainbow in the Dark". Tonight Dio was accompanied by guitarist Tracy G. and bassist Larry Dennison, as well as ex-AC/DC drummer Simon Wright. Never mind that Dennison looked more like a boy band member, never mind that Wright's drumming talents rarely reached the mediocre, never mind even that Tracy G. shall be known as "the guitarist with one chop, one trick and one special effect" - because Dio was there and his voice was impeccable. Stunningly so, as a matter of fact, especially when you see Dio appear on the stage as a positively diminutive man who is definitely getting on as well. From the beginning to the end, well over an hour and a half later, there was a lot of audience contact, he sung brilliantly, and first and foremost he seemed really to be having a ball of a time himself. I had expected to witness a fading rock icon, but nothing could have been further from the truth. His talents are unmistakable and still present, and I for one am really glad I had decided to convince my fellow afficionado - with wheels - to come along. Of course Dio played plenty of his solo material, of which I failed to recognise only a few tracks. There was "Don't Talk to Strangers", of course, "Rainbow in the Dark", "Holy Diver", "Night People" and "The Last in Line", as well as "We Rock" as part of the encore. But he didn't forget the many people who had learned to appreciate him while he was member of Rainbow and then Black Sabbath. "Stargazer" was the biggest and nicest surprise (although Tracy G. is hopelessly incapable of playing the solo), "Mistreated" (see previous remark on mr G.'s talents), "Man on the Silver Mountain" and "Long Live Rock'n'Roll", whereas his Sabbath period was represented by the inevitable sing-along classic "Heaven and Hell", as well as "Children of the Sea", "Neon Knights" and "Mob Rules" (part of the encore). Especially "Stargazer" sent tears to my eyes despite Ritchie Blackmore not being there to play the solo properly. That song on its own would have made my evening, but the whole evening was pretty cool, really. I didn't mind too much about his by now cliched stage presence involving the wagonloads of evil signs. The man's smile, the obvious joy that he had performing in front of an enthusiastic mob, made the evening a success. Especially in these days of bands that really take themselves frightfully seriously and that just glare and look evil, the simple presence of a thoroughly sympathetic man like Ronnie James Dio makes up for everything. Oh yeah, there was a support act, too. Seqoiah. They had fun and weren't too bad at all, but it was Dio that I'd come for, really.